In some corners of the world, art serves as a vehicle to confront faulty politics- and one such corner of the world would be in Yerevan, Armenia. This confrontation is both a uniting force and dividing force for artists and activists. Armenia is a fascinating and rich country- full of traditions that go back to the foundations of civilization. It’s a mixing ground for remnants of old empires, and new ideas of wealth. Like one of the country’s most symbolic and rich art forms, carpet making, Armenia is a place were ideas of the West and the East are woven together. My interest in Armenia began with my fascination with linguistics, and my curiosity to think of language as a visual element. Armenian is a unique Indo-European language, having their own ancient alphabet, which is at that heart of the country and it’s people. It seemed to be a good place to start my research. In November of 2009, I participated in an artist residency at Arts and Cultural Studies Laboratory, in Yerevan which turned out to be one of the most valuable experiences of my life thus far. Not only was I impressed with the talent around me, but with the eagerness with which art was approached, and how artist possibilities and expression took on something much heavier and bigger than the individual artists. Today, I hope to return to that part of the world, more informed and culturally prepared to make art. In Yerevan, serving as the country’s premier contemporary art gallery, is the Armenian Center for Contemporary Experimental Art, better known as NPAK. Often home to controversial shows which directly challenge politics, NPAK currently has a show ‘Toy of the Idle Time’, featuring some of Armenia’s most talented artists. In the first part of this interview, I speak with the curator Seda Shekoyan about her vision of political art and the troubles of art activism and artist Hovhannes Ishkhanyan about the rights of free speech and the Armenian military culture. Seda Shekoyan was born in 1988, in Armenia. She is an art critic, theorist and curator from Yerevan, where she lives and works. Since 2010, she has been the Director of Fine Arts Department in the Armenian Center of Contemporary Experimental Art (ACCEA, “NPAK” in Armenian acronym). Since 2008, she has managed the art criticism and theory section of the online magazine named “Armenian Times”. 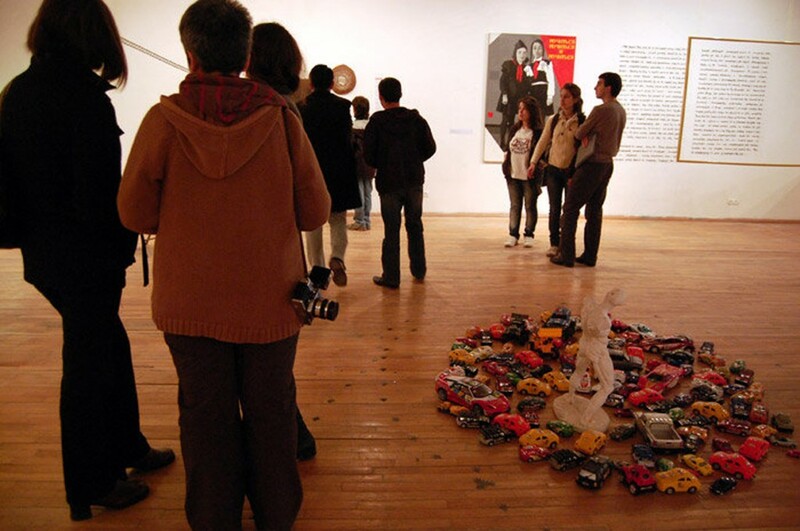 In 2010, during her tenure at ACCEA/NPAK she curated the 12-th Annual Alternative Art Festival called “Spying on Armenia”, as well as a group exhibition titled “Toy of the Idle Time”, which was a reflection of artists on recent movement of civic initiatives and action in Armenia. She has authored a number of articles and translations related to contemporary art, theory, curatorial practices and literature. Sarah Kunkler: As a curator based in Yerevan, can you define the role of artists, as activists, within the political environment? Seda Shekoyan: About your question…For me as curator and art critic there is not a political environment as measure or criterion for artistic achievements…For understanding this project-“Toy of the Idle Time”-it is also basic. For example, in Armenia, as well as abroad, 1. There are artistic practices, in which the revolutionary potential is realized, but 2. There are works, which want to throw themselves into the political stream or revolutionary movement. This second one is not valuable or interesting for me… Of course, it doesn’t mean that I will not represent such works, but for me the first one is important and interesting. For me terms, such as act-active-activism are esthetic categories, not political. This is very important. Of course not all artists will share my opinion, or vision, but I give opportunities for representing other visions. 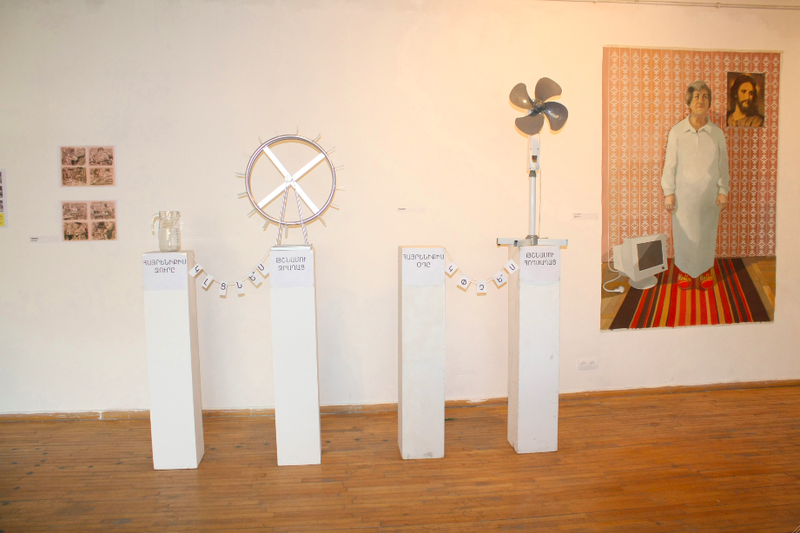 "One Step Beyond Daily Life" Installation by Ovsanna Shekoyan in "Toy of the Idle Time" exhibition. Sarah Kunkler: You’ve chosen a very interesting, and provocative title for your exhibition. In your statement you make a comparison between an idle toy, and a smoking gun, and that both of these objects can challenge an individual equally. How is this comparison reflective of what is happening now, in Armenia, in terms of activism and art? Seda Shekoyan: The title of the exhibition, as you notice exactly, is provocative, but at the same time, it is the reference. It refers to the two contexts. 1. “Toy of the Idle Time” is very popular expression in Armenian journalism, where it works in its negative meaning. 2. At the same time this expression is the title of Armenian writer’s book (Khachatur Abovyan, 19th century), where it works in its opposite meaning, where idleness was regarded as time, that precede the activism. We can say, that the writer bears in mind the idleness, which is productive, the product of which can be, for example, a book-writing as in the case of Khachatur Abovyan, who begin his book with these words. “When I was idle…”, which is the time when he was thinking about writing this book. The title is provocative, because it brings with itself these two opposite meanings (from journalism and from literature) and because it is some kind of bait. I think a comparison between an idle toy and a smoking gun is very reflective of what is happening now in Armenia. There is real barrier in Armenia between activists and artists. They can know each other face-to-face, but as a rule they don’t know each other well in the sense of their work. I can’t do art as a curator, and I can’t do activism, but I thought that I could fill the gap, which is between them. Hovhannes Ishkhanian was born in Yerevan in 1988. In 2006 he joined the army. There, Hovhannes felt the “Army was a good place for inspiration for writing.” After completing his military service, Hovhannes and his colleagues from the army established “Proportional Development,” NGO. He also wrote articles about the armies, which were published in “Ankakh” newspaper. His short story “Day of discharge” has also been published in “Inknagir” literary magazine. 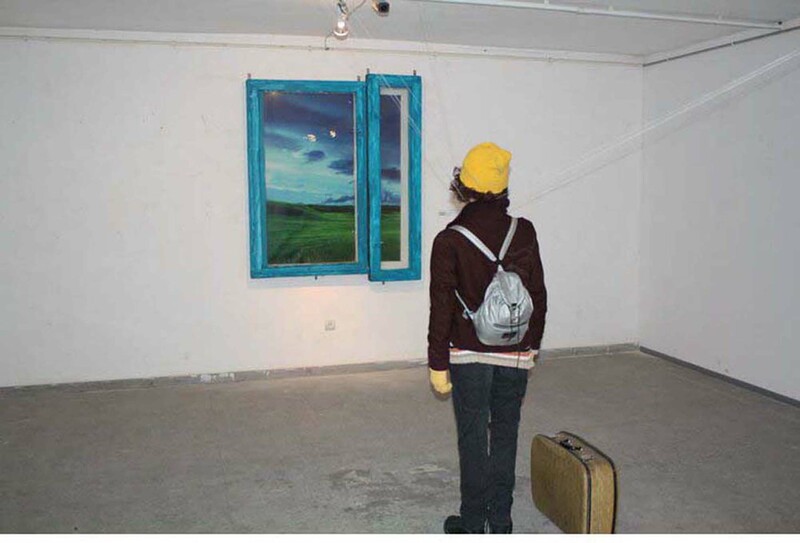 Hovhannes has participated in two art exhibitions: “Spying on Armenia” and “Toy of the Idle Time.” Currently he is a student in European Regional Academy, department of applied programming and is a freelancer for the “Erkir” newspaper. Sarah Kunkler: I’m familiar with the video, and I know that this video was quite controversial. The government tried to remove it from being online, am I correct? In your work at NPAK’s show, you show primarily photographs of soldiers, in their uniforms, but in relaxed, casual poses, doing typical, everyday activities. 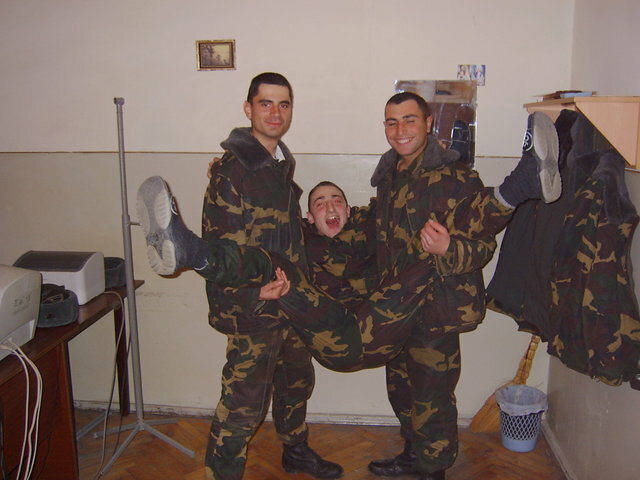 What are you saying about the Armenian army? Hovhannes Ishkhanyan: I don’t know whether the government tried to remove the video or not but I know that many young activists tried to do it. In summer 2010 anti-propaganda towards the army started in Armenia, which I think was for political reasons. This video was one of the tools of it. Everyone started to talk how violent our army was after the video was published. The title “Real face of Armenian army” was not right for me; it was only one of the faces of the Armenian army. So I wrote a text where I told about my sufferings in the army, how an officer beat me etc. I asked a question: who didn’t know about that? Why is everyone amazed? To publish that video is not a way to stop that phenomenon in the army. The video could be given to military police. It is also bad for an army if such things can be leaked. If a video can, then everything else can: maps, strategies etc. 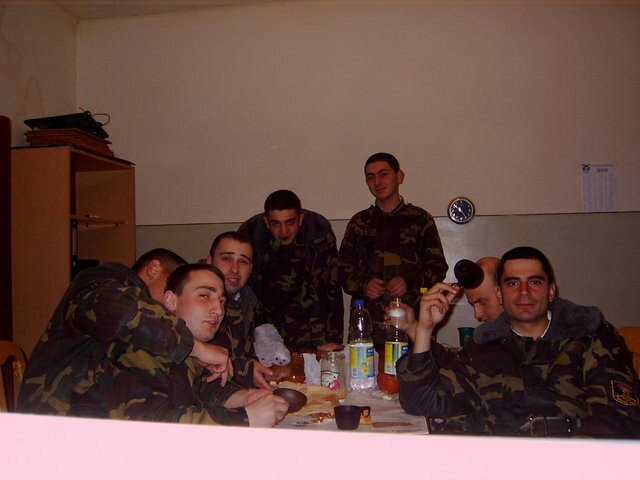 I published the photos to show the other face of the army. Sarah Kunkler: So, if I understand correctly you have a different opinion about this video, and about what it says about the Armenian army; is this correct- you think that people were aware of the violence within the army, and they just were apathetic to it? Could you tell me more about what you mean when you say that the video was used as ‘anti-propaganda’? Hovhannes Ishkhanyan: No, I agree with the video because I know that such things and even worse than in the video are happening in the army every day. But I don’t agree that it should be posted on youtube. The place it should be taken to is military police. The video was published on youtube to discredit the army and yes people knew about the violence in the army, and I think most of them were apathetic not only towards the violence, but towards the army as well. They had political reasons to discredit the army, to write everywhere that our army is the worst and that we should demand the suicide of the defense minister (which I think is the best minister of defense we have ever had), to make a movement for that demand and to petition for that, that was the anti-propaganda, and the video was the continuation.